In this edition of Muscle Car Milestones, we’ll look back at the 40 year history of the Shelby GT350H and GT-H. When the Shelby GT350 burst on the scene in the mid-1960s, it was the hottest pony car you could buy. So what better way to get the GT350 in the hands of enthusiasts and prospective buyers than to offer it for rent? Thus, the GT350-H was born. For 17 dollars a day and 17 cents a mile, you could rent one of the hottest cars around. Let’s take a look at what makes the Shelby GT350-H and its successors some of the most highly sought after muscle cars ever created. “Renting a Shelby Mustang is bound to be more ego-gratifying than a no-go small-bore import or a big, blowsy “sport-type” American sedan. The GT350 is a real guts sports car, with hair on its chest—all the way down to its navel”. Car and Driver, May 1966. Shelby created 1,000 of these “Rent-A-Racers” for use exclusively by the Hertz Rental Car Company. Most were black with twin gold rally stripes that ran from the front grille to the rear bumper. A few were painted in red, white, blue, and green. Inside, the GT350H featured a driver-oriented instrument panel with five-dial instrumentation, bucket seats, and simulated wood rim steering wheel. The GT350H was marketed as an alternative to business travelers who wanted something different to drive and to vacationers who consider motoring a pleasurable experience. But let’s be honest, many drivers that rented these did so to race them. The GT350H comes equipped with the same Cobra High Performance 289 cubic-inch V8 found in the “regular” GT350 and could be equipped with either a 4-speed manual or 3-speed automatic transmission. This pint-sized V8 produced 306 horsepower and 329 foot-pounds of torque. Getting this much power from the small V8 was achieved by the use of a four-barrel carburetor mounted on a Cobra high riser intake manifold, tubular steel exhaust headers, and straight-through, low restriction mufflers with twin pipes in back. The Shelby GT350H came standard with a wide variety of performance equipment. Wide-base wheels with 15-inch Goodyear Blue Streak tires, rear trailing arms, a one-inch front anti-sway bar, and Koni shocks are just a few pieces of standard equipment. The braking system consists of front Kelsey-Hayes discs with heavy-duty pads and out back you’ll find 10×3-inch drums with sintered metallic linings. Car and Driver tested the 1966 GT350H and achieved a 0 to 60 time of 6.6 seconds and ran the quarter mile in 15.2 seconds running 93 miles per hour. Car and Driver stated the GT350H is a “for-men-only machine, requiring strong arms to twist the steering wheel, strong legs to push the pedals, and strong kidneys to survive the ride”. It took 40 long years but Ford, Shelby Automobiles, and Hertz Corporation collaborated once again and created the Shelby GT-H. Approximately 500 of these special editions were created and were available for rent at choice airports across the country. 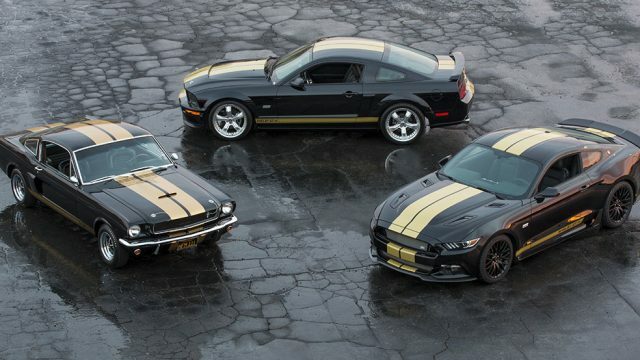 And just like the original, these limited edition Mustangs were decked out in black paint with dual overbody gold racing stripes and rocker stripes with “Shelby GT-H” lettering. Other identifying features of the Shelby GT-H include a Hertz emblem on the front fender, Hertz sill plates, and a numbered dash applique with Carroll Shelby’s signature. Under the hood, the Shelby GT-H features a 4.6-liter V8 with 325 horsepower and 330 foot-pounds of torque. This power plant is mated to a 5-speed automatic transmission. Performance upgrades include a Ford Racing 90mm cold air kit, FR1 Power Pack, and cat-back exhaust. The GT-H also features the FR3 Ford Racing Handling Pack and Ford Racing’s 3.55:1 ratio rear axle. Motor Trend tested a 2006 GT-H and walked away with some impressive numbers. The Shelby GT-H could go from 0 to 60 in five seconds and run the quarter mile in 13.6 seconds at 102 miles per hour. Also, according to the Motor Trend review, in order to keep the GT-H out of the hands of racers, drivers had to have a valid plane ticket or an itinerary proving their out of town residency and recent arrival. Otherwise, you wouldn’t be handed the keys to the GT-H. The Shelby GT-H returned once again for 2007. This time around, you could drop the top, crank up the tunes, and hit the road. That’s right, the first convertible GT-H was now available as part of Hertz’s Fun Collection. And just like last year’s coupe, it still retains its signature black paint with dual LeMans gold stripes. It also mimicked last year’s production numbers with only 500 built. The 2007 Shelby GT-H’s styling was unmistakable. Each featured gold “GT-H” rocker striping, a Hertz emblem on the front fenders, Hertz Shelby GT-H sill plates, and a numbered dash plaque with Carroll Shelby’s signature. The upper and lower grilles featured brushed aluminum with a Mustang emblem. And side body scoops, along with 18-inch black aluminum wheels, set the Shelby GT-H apart from the run-of-the-mill rental fleet. Hertz typically held on to the GT-H until they reached around 16,000 to 18,000 miles. Then they were offered for sale by Ford dealers or made available at auctions. In fact, the first 2007 and only brand-new Shelby GT-H convertible was auctioned for charity at Barrett-Jackson’s West Palm Beach 2007 auction. It hammered for a jaw-dropping $250,000. A recent internet search reveals the GT-H is commanding prices ranging from $27,000 to as high as $67,000. To celebrate the 50th anniversary of the Shelby GT-H, Ford, Hertz, and Shelby created the 2016 Shelby GT-H. A very limited run of 140 cars was made available as part of Hertz’s Adrenaline Collection. The GT-H was conceived with distinctive design cues such as a Shelby front splitter, rear spoiler, and GT-H upper and lower grille. And what GT-H would be complete without its trademark shiny black paint and gold striping? Each 2016 GT-H is outfitted with a 5.0-liter engine producing 435 horsepower. It’s basically the same as the “regular” Mustang GT but with a Ford Performance handling pack, Ford Performance cat-back exhaust, and a staggered wheel kit thrown in the mix. Performance-wise, the GT-H is capable of going from 0 to 60 in just under five seconds and sprinting the quarter mile in approximately 13 seconds. When Shelby American and the Hertz Rental Car Company originally banded together in the mid-1960s, they created a timeless classic that still thrills enthusiasts to this day. And the heirs to the throne that came after it helped keep that spirit of the original alive. No other rental car has the legacy and admiration as the Shelby GT350H and GT-H.